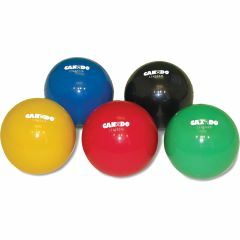 The color coded Cando Hand Wate Balls are small enough and flexible enough to grasp with one hand, yet big enough to hold with two hands. Hand balls increases in weight from 1.1 lb. through 6.6 lbs. while maintaining a constant 5" diameter. Balls are soft and have give. Use a bicycle pump to inflate/deflate to make ball harder/easier to grasp. Great product to incorporate into Pilates routine.